Garnets have been used since the Bronze Age as gemstones for jewellery and ornaments and they have been favoured by the rich and famous for many centuries; red garnet necklaces once adorned the necks of Egypt’s pharaohs. Australia produces almost half of the world’s garnets, and what may be surprising is that not all garnets are red. Most commonly, they are found in vivid red shades, but actually exist in a range of colours – orange, yellow, green, purple, brown, black, pink and in fact, some are even colourless. Garnets are rarely treated because heat and radiation have little effect on the stone, however, they can be cut into many different shapes depending on the size of the rough crystal, making this resilient gemstone an ideal way to introduce colour into your attire throughout the festive season. 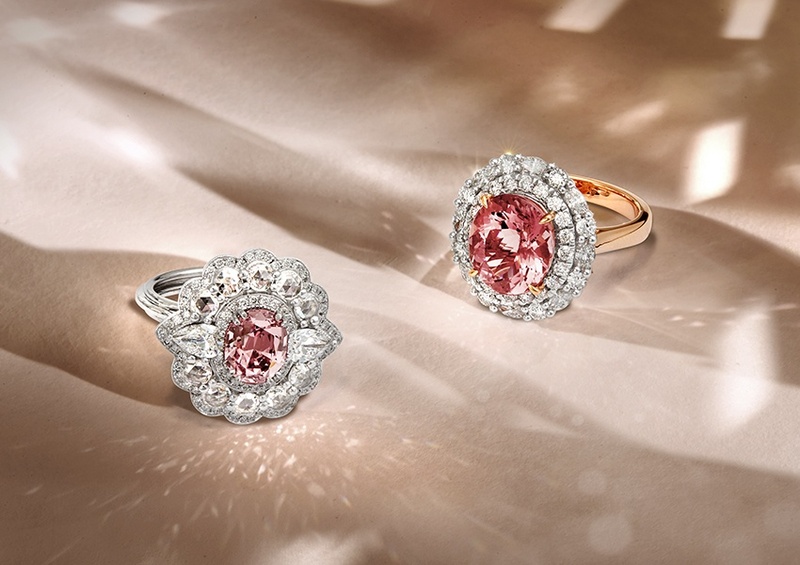 Our rare Tanzanian Garnet Dress Ring is the perfect pink shade to add a sophisticated yet opulent touch. This ring is set with a mesmerising 2.88ct Mahenge Garnet, surrounded with a triple halo of pear, rosecut and round brilliant diamonds making it a sensational introduction to the world of blush jewellery. Another increasingly popular pink gemstone, morganite, also comes in an assortment of shades, from peach and rose to very deep reds. As part of the Beryl variety, morganite’s in darker hues are rare and particularly difficult to source making them extremely valuable. With great durability, morganites can be a more vibrant substitute to diamonds that can endure a lifetime of wear. Growing in popularity amongst engagement rings, the delicate pink colour provides an everlasting and unconventional symbol for the most romantic occasion. An incredible example of the sublime shades available in morganite is demonstrated in our beautiful new deep pink Morganite and Diamond Dress Ring. The morganite’s subtle yet bright tones create the perfect accompaniment to other gemstones and it can be applied to any setting – be it yellow gold, rose gold or platinum. Not to mention, the variety of available shapes, sizes and cuts, which empower the wearer to showcase their unique personality in a way that’s still timeless. Follow us on Instagram to see more incredible rose-toned pieces from our latest campaign.